We’ve found an amazing dupe of Meghan Markle’s denim polo dress - and it’s a high street steal | HELLO! 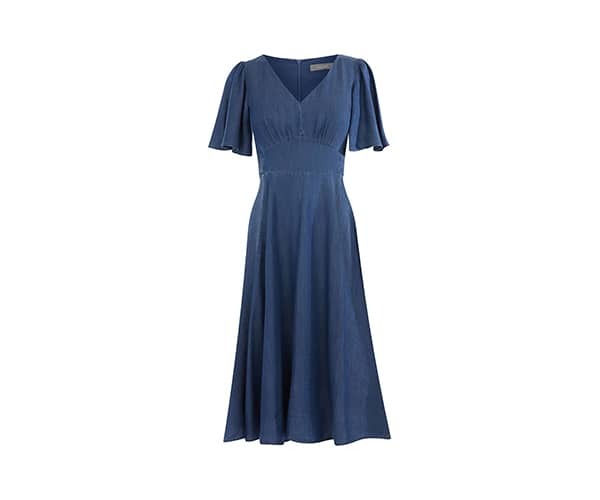 July 27, 2018 - 20:39 BST Laura Sutcliffe Meghan Markle wore a stunning denim dress by Carolina Herrera to watch husband Prince Harry at the polo - and we’ve found a near-on identical copy for £55 from high street store Oasis. The Duchess of Sussex turned heads on Thursday afternoon as she watched her new husband Prince Harry play in the Sentebale Polo Cup which took place at the Royal County of Berkshire Polo Club, in aid of children in Africa living with HIV and Aids. Cheering Harry on the sidelines, Meghan,36 stunned in a beautiful denim dress by high end designer Carolina Herrera. The midi-length dress was made in a flattering fit-and-flare design and had a nipped-in, belted-waist, with delicate capped sleeves. The stunning design is part of Carolina Herrera's 2019 Resort Collection and is worth a whopping £2357. If you want to look as divine as a Duchess but don't have a spare few thousand - we have found an amazing dupe -it's from high street store Oasis and costs a far more purse- friendly price of £55. The bargain number features the same material and is a dead-ringer for the designer version with its almost identical shape. Although the dress was a huge talking point - so was her clutch bag which was actually a sale bargain from luxury high street store J.Crew. We thought our eyes had deceived us when we learned the rattan clutch was down to £44 in the sale - and at one point, it could be purchased for a mere £26.93 with an online discount code. Talk about a royally good bargain! What’s more, the former Suits star isn’t the only fan of this summery piece of arm candy - the Duchess of Cambridge's sister Pippa Middleton also carried the very same clutch at Wimbledon earlier on this month. The oval-shaped bag is a classic design that is fitted with contrasting tan straps and also comes in a funky neon yellow. The website went into overdrive after the American star wore it - and at one point, over 3000 people were looking to purchase the clutch - which predictably, sold out immediately.